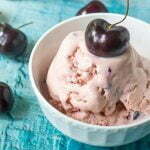 Nothing says summer like a bowl of ice cream, so why not make it low carb black cherry ice cream? 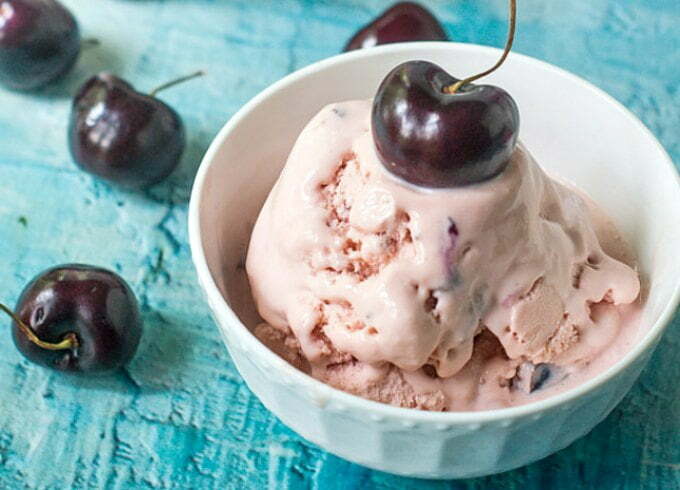 It so rich and creamy and full of that black cherry flavor goodness. Only 3.7g net carbs per serving. I am on a mission to make a good low carb ice cream. 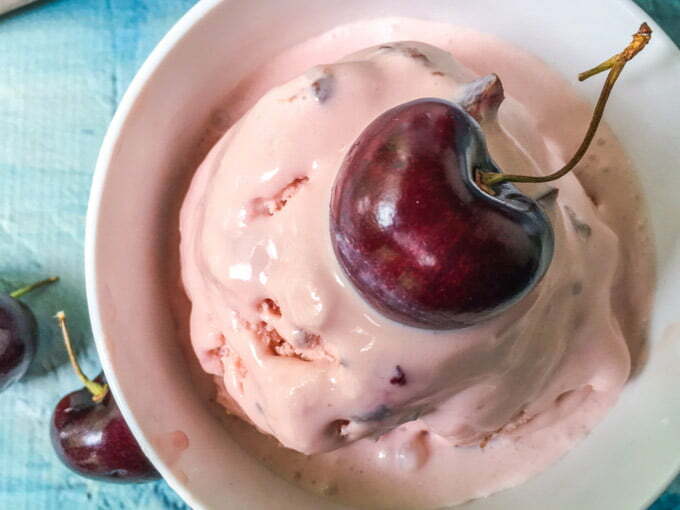 I was pleasantly please with my caramel butter pecan recipe last week so today I thought I’d try a low carb black cherry ice cream. That is my hubby’s favorite too! While last time that was a no churn ice cream, this time I used an ice cream machine and I have to admit I liked it better. My family thought it was just like store bought with one exception. It still needs to soften before scooping and that is because there are no stabilizers in it. Start with a custard base ice cream mixture. That means using egg yolks which makes a thicker, creamier ice cream. Use an ice cream machine if possible. This really does help because it adds more air and makes it softer. Use heavy cream. If you use milk it has more water and therefore more crystals when freezing. I bought this ice cream maker many years ago and I have only used it a few times. It just seemed like too much work to make your own ice cream but now that I want to make low carb ice cream it has really come in handy. 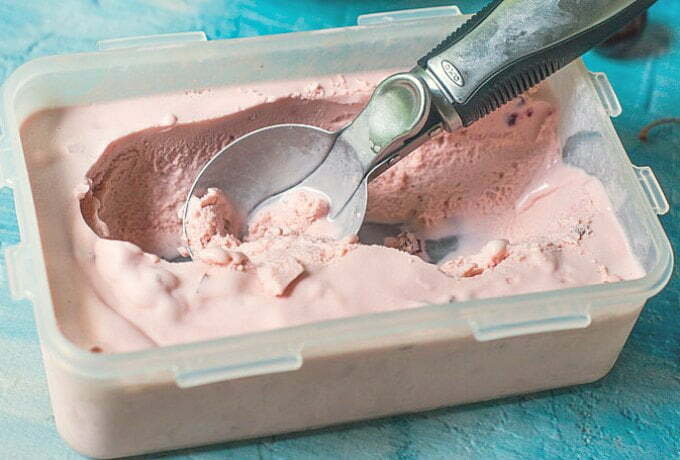 You have to freeze the container over night before using but other than that it’s very easy to use. Also note the containers I used below. I love these small ice cream containers. They are the perfect size for homemade ice cream. Each is only 6oz and to me it’s the right amount to eat for these rich treats. Also I use a plastic container for the rest so I can scoop it out. For me this system works. I can fill 4 tubs and put the rest in the plastic container. Because this is a custard based ice cream I heated up the monk fruit sweetener, almond milk and heavy cream on the stove. In a bowl I whisked the egg yolks while the mixture heated up. Once the cream was hot I took a cup of it and mixed it in the eggs. Then I added this mixture to the saucepan and heated until it coated the back of a spoon. Lastly I strained it and let it come to room temperature. After it has become room temperature, I added the sugar free syrup, cherry extract and a few chopped cherries. To be honest I don’t think the chopped cherries added much so I would leave them out next time. Once these are mixed in, I set it in the refrigerator over night and put it in the ice cream maker the next day. Note* I used cherry extract, monk fruit and sugar free black cherry syrup, all of which had no calories or net carbs so I did not include them in my calculation. Please do your own calculations if you are concerned about precise nutrition. Check out my Amazon page for the items I used in this recipe! 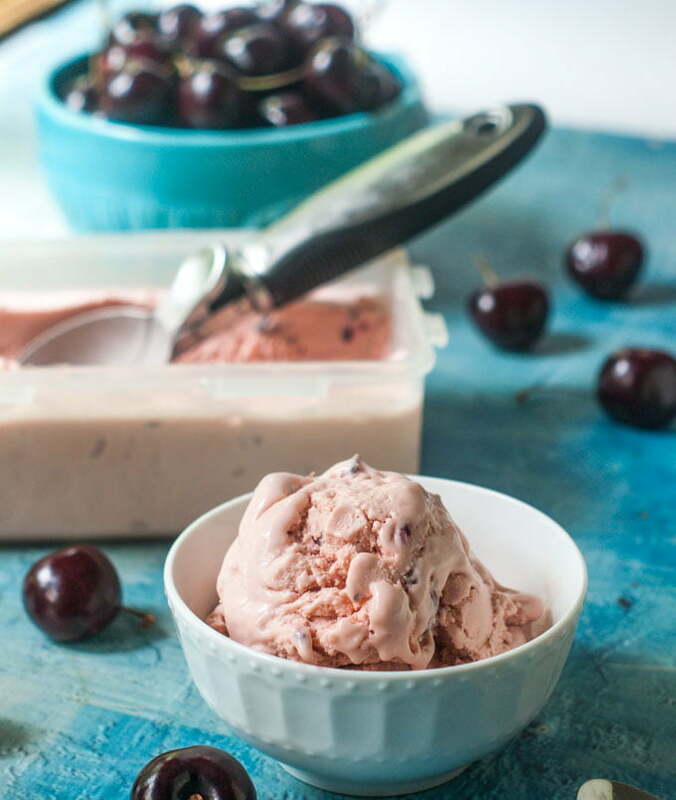 Nothing says summer like a bowl of cherry ice cream, so why not make it a low carb black cherry ice cream? It so rich and creamy and full of that black cherry flavor goodness. Only 3.7g net carbs per serving. Strain liquid into a big bowl and let come to room temperature. 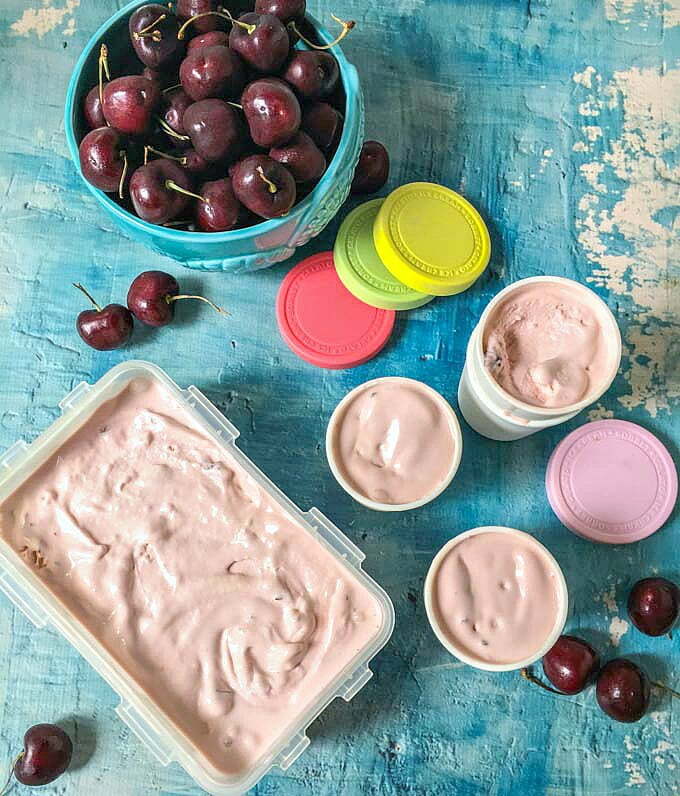 Mix in extracts, cherries and sugar free syrup and place in the refrigerator overnight. The next day pour into your ice cream maker and follow the manufacturers directions. *NOTE* I didn't feel that the chopped cherries added much. If you are not doing low carb, I would suggest adding more. And if you are doing low carb, you may want to omit them all together.